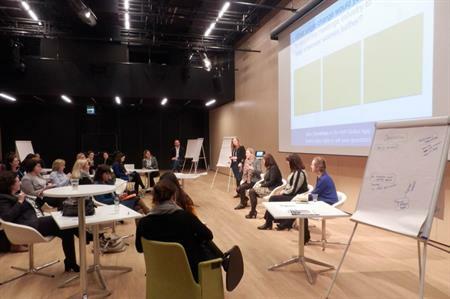 Industry professionals at the MPI European Meetings & Events Conference (EMEC) 2015 gathered to discuss the key challenges facing women in events today. An all-female audience joined a panel yesterday afternoon (2 February) made up of FreemanXP’s Jane Baker, owner of Nyt Potentiale Karin Krogh, HelmsBriscoe executive director Carole McKellar and MPI executive board member Fiona Pelham to discuss the roles of women in the events industry. The discussion began with some revealing statistics taken from a Harvard Review business paper, stating that it takes women on average 50% longer to get to CEO positions – roughly 24 years as opposed to 15 years for men. The first on the panel to speak was Jane Baker, vice president of client services, FreemanXP, who highlighted three things she believes hold women back in big businesses. Baker said: "The first point is around company culture. If you’re going to stay at a company for more than 24 years then you really have to love that organisation. You have to completely affiliate with all of its values and you have to enjoy the culture and working environment. "Big businesses are generally quite bureaucratic and these organisations aren’t always the most inspiring places for women to work if you don’t enjoy navigating through politics. "The second thing is the motherhood penalty. One member of the couple needs to step away from their career to raise children. Women don’t have to be the ones to do this but once they do step away from the corporate ladder other people come in and start to take up those positions that women could have been elevated into. "The third point is around choice. I think a lot of women are looking for a role that is both enriching and one with a culture that they really affiliate with but also one that works with their personal work/life balance. "Many women that I see that are very successful leaders have stepped away to start their own agencies and they run their own companies in a way that suits them." Karin Krogh followed this by stating the importance of women making their achievements known in the work environment. She said: "Men are very good at bragging. We all have to make sure that we brag as well. If we do everything right then nobody notices, so that is why we have to document it. "If you don’t brag your leaders will never know how good you are so when someone is up for promotion it will not be you because they don’t recognise you." Next on the panel was HelmsBriscoe’s Carole McKellar, who highlighted another interesting challenge that some women face in the events industry. "One of our challenges is that we fall into a traditional view of what success looks like and sometimes we’re aspiring to something that doesn’t suit us. You need to define what success looks like for you and that’s where it becomes much easier to balance competing priorities. We need to define what’s important to us." Fiona Pelham concluded the discussion by sharing the lessons she learned on her journey to becoming chair-elect on MPI’s international board for 2014-15. Pelham said: "I attended a leadership dinner when I was chapter president for the UK and Ireland and the dinner was full of men. I was very surprised because my experience of MPI and the events industry as a whole was that there are a lot of women. "I reached being chapter president in the UK and I was very happy and I wasn’t thinking about moving onto an international level, but when I saw the opportunity I saw that this was my chance to be brave because clearly there’s something missing and there’s a gap that I can help fill." Throughout the panel discussion, questions were put to the audience, with the responses being polled on the main screen. In January, Zibrant's Fay Sharpe announced she will launch Fast Forward 15, a career-mentoring scheme for 15 women working in events and hospitality, which will launch this March.